1. Which Is The Highest In Calories? 2. Who Needs More Calories? 3. Which Is The Highest In Fibre? 4. Which Is The Lowest In Fat? 5. Which Is The Highest In Salt? A banana has around 143 calories, and a custard cream biscuit has about 57. While the biscuit has fewer calories, the banana will release its sugars more slowly, so feel satisfying for longer, and also has vitamins, minerals and fibre in it (though a biscuit is fine as an occasional treat). Looking for something lower calorie? 100 g of carrots has around 30 calories, and 100 g of strawberries has around 27 calories. While the need for calories will depend on levels of activity and time of year, a teenage boy needs around 2755 kcal per day, whereas an adult male needs around 2550 kcal per day. A medium avocado has about 5.2 g of fibre, and is full of vitamins and minerals and is a good source of protein, though it is quite high in fat. 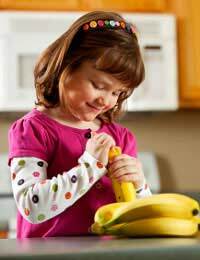 Children can eat a proportionally higher fat diet than adults, because they are still growing and are generally more active, and the fat in avocados is monounsaturated, so is healthier than that in meat and dairy products. A teaspoon of peanut butter contains 5.4 g fat, but a jam doughnut contains 10.9 g fat and a slice of carrot cake can be less than 10 g of fat, or more than 50 g of fat, depending on how it is made – in some carrot cakes, the icing is made from full fat cream cheese – great as a treat, but not something for every day. Some fat is essential, to help the absorption of fat-soluble vitamins (A, D, E and K), and to keep cell membranes and nerves healthy. In children up to the age of three, 30 -35% of their calories should come from fat; this falls to 25-35% over the age of three. Seawater contains around 2.5 g of salt per 100 g, but this is beaten by cornflakes, which can contain up to 2.75 g of salt per 100 g. Though many manufacturers have reduced the salt content in bread, it can contain up to 1.5 g salt per 100 g. Crisps are actually around the lowest, at 0.5-1.4 g per 100 g.
Children of up to three years should have a maximum of 1-1.5 g sodium per day. This increases to 1.2-1.9 g at four to eight years, and 1.5-2.2 g from nine years up (1 g of sodium is equivalent to 2.5 g of salt). Fun Facts: How Many Calories...? Fun Facts: How Many Calories Does a Child Burn? Re: Fun Facts: How Many Calories Does a Child Burn? Re: Is My Child Obese?